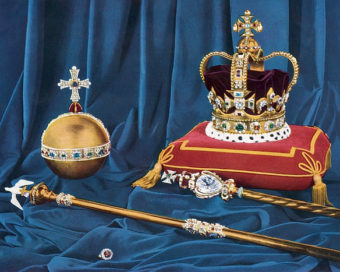 The crown jewels are a collection of historic and obscenely valuable relics closely associated with the British monarchy. For centuries these golden, jewel-encrusted trinkets have been kept under the watchful eye of burly guards in the Tower of London. And to doubly deter thieves, historically the punishment for attempting to steal them was death… something Thomas Blood thumbed his nose at when he waltzed right into the Tower of London and tried to steal them in 1671. A charismatic and likeable man who reportedly had oodles of Irish charm and a razor sharp wit, Blood was able to get close to the most cherished symbols of the British monarch by the oldest conman trick in the book- simply befriending an individual who had full access to them, the 77 year old Keeper of the Jewels, Talbot Edwards. Blood visited the Tower of London disguised as a humble clergyman and buttered Edwards up with compliments before instructing an attractive female companion who was an actress posing as his wife to feign a crippling stomach ache. Edwards being the gentlemanly sort, and having his apartment just above the place where the crown jewels were kept, immediately called for his wife to tend to Blood’s companion, which allowed the self-styled dashing rogue to begin working his magic on the rest of the Edwards’ clan, showering them with small gifts in a faux display of gratitude for tending to his wife. Upon successfully integrating himself into the Edwards family’s good graces, Blood casually mentioned that he had a wealthy nephew who was looking to marry, knowing full well that Edwards had been looking for a sufficiently well-off suitor for his daughter. Edwards understandably jumped at the chance to meet this mysterious nephew and arranged for a meeting- a meeting that Blood just so happened to come to with not only his nephew (who was actually his son), but also three other companions, Robert Perrot, Richard Halliwell, and William Smith. As for these, when the group arrived at the Tower of London on morning of May 9, 1671, Smith was selected to wait outside the gates with the horses while the others proceeded to the Edwards’ abode. While the group waited for Edwards’ wife to prepare food, Blood casually asked if Edwards would take them to go see the famed Crown Jewels. It should be noted here that part of Edwards’ job was in fact to show people who paid a fee the jewels, so this was nothing terribly out of the ordinary. Thus, happy to oblige his new clergyman friend, the elderly Keeper of the Jewels, said yes and led the men downstairs to the room where the Crown Jewels were stored. As soon as the door to the room was unlocked, Blood dropped his facade and the group roughly beat Edwards and then stabbed him in the stomach for good measure. Once Edwards was subdued and gagged, Halliwell went to serve as a lookout while Blood, the son of a prominent and relatively wealthy blacksmith, grabbed the crown and, using a previously concealed mallet, quickly hammered it flat in order to make it easy to conceal. While he was doing that, Perrot unceremoniously shoved the Sovereign Orb, symbolising the might of the British empire, into his pants…. While all this was happening, Blood’s son attempted to cut the Royal Sceptre in two as it was too big to similarly conceal otherwise, even for the most boastful of men. Mr Edward’s son coming in and finding that his father had been hurt ran after [them]. One of the villains shot at him but missed, as were the guards but they kept up with them and captured two near the Iron Gate, old Blood who was disguised as a priest called Ailoffe and one called Perrott. Afterwards Blood’s son [was captured] when he fell from his horse near Gravel Lane, he was named Hunt and was the person who had kidnapped the Duke of Ormonde. They were brought to Whitehall and taken into custody, the other two escaped. Upon being arrested, Blood, a somewhat prominent fellow already owing to his exploits during the English Civil War (including afterwards twice trying to kill the Duke of Ormonde, James Butler, and supposedly even making an attempt on the King’s life), among other escapades, refused to speak to anyone but King Charles II himself about the events surrounding his attempted robbery. Amazingly, the King agreed to meet with Blood, who we should probably mention already had a bounty of one thousand pounds on his head owing to his previous exploits unconnected to this particular robbery. During the meeting, Blood used every ounce of his charm to amuse and ingratiate the King and the others present, including The Duke of York and various members of the royal family…. It worked. After reportedly thoroughly entertaining the King with the daring tale of the robbery, the stories of the many adventures Blood had had over his life, and throwing in a bit of flattery, including telling the King he once almost murdered him while the King was bathing in the Thames, but stopped short when he witnessed the King’s majesty, the King gave him a full pardon. And not just for this crime, but also for any crimes Blood had committed between May 29, 1660 and the then present day of the pardon proclamation, August 1, 1671. Blood’s son and other captured companion were likewise let go. The good outcome didn’t stop there for Blood. You see, during the English Civil War, Blood had for a time supported Charles I, but when the King appeared as if he would lose, Blood switched sides. Thus, when Charles I was ousted, Blood was given an estate and made, ironically, a Justice of the Peace. However, when Charles II took over, this estate was taken from Blood. What does this have to do with his present circumstances? Well, not satisfied with just pardoning Blood, King Charles II decided that in reparation for Blood’s previously taken lands, the King would give him an estate that provided an annual income of around £500. While it’s difficult to accurately translate this amount to modern pounds, very loosely speaking today this would be about a million pounds worth of labor, or around £70,000 pounds (about $95,000) by value of the goods one could buy. In other words, perhaps in Blood the King saw an intelligent, educated, charming, and well connected person (among both the nobility and criminal sects) who didn’t mind getting his hands a little dirty to achieve an end, so decided to pardon him and put him on a pension via the estate, with at that point Blood functioning as something of a spy and political operative for the King. However, there is no hard evidence to support any of these suppositions and it may well really be that he and his little escapade, including the dashing way Blood described it, simply amused the King as was reported in contemporary accounts of the affair. In that case, apparently the old adage of “Crime Doesn’t Pay” doesn’t apply if the absolute ruler of wherever you live happens to find the crime especially hilarious. Before my Grandfather past away he looked into our family history and foud that Thomas Blood is an ancestor of ours! This is a wonderful article!! Blood took the jewels he stole to Minley, near Farnborough in Hampshire, about 35 miles west of London and was arrested at a public house, now called the Crown and Cushion.